It’s 6 p.m. on a Thursday, and a break room at Workday’s headquarters in Pleasanton, California is packed. A long table in the back is covered with pizzas, mostly untouched. 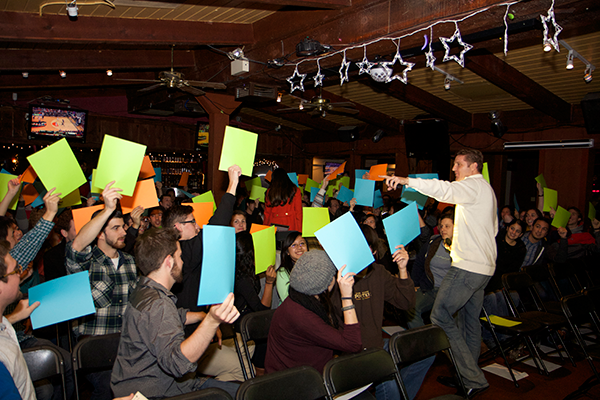 Dinner can wait—the crowd is here to learn. The 200 people in attendance are members of Generation Workday and they’ve come to hear software engineering manager Kevin Jarvis talk about Workday’s object model. For many of them, Workday is their first professional job since graduating from college. They are the generation known as Millennials, and they represent the future of Workday. The U.S. Bureau of Labor Statistics predicts that Millennials will comprise nearly 50 percent of the nation’s workforce by 2020. The Generation Workday program, developed specifically for new college graduates, supports a culture invested in the long-term success of Workday’s youngest professionals—some of who will become the future leaders of Workday. Like all generations, the personality characteristics of those born in the 1980s and 1990s are partly shaped by the world they grew up in. That era included big innovations in personal technologies and the emergence of the Internet, but also difficult times that impacted many communities including the events of 9/11, war, and recessions. In the book “Millennials Rising,” authors and generation experts Neil Howe and William Strauss make the case for a generation that’s civic-minded, upbeat, networked, and team-oriented. Making the world a better place, and a collaborative work culture, also are priorities for Millennials, according to an Intelligence Group study. The ongoing speaker series that Jarvis led is just one of many events and networking opportunities designed for Generation Workday. Another was Generation Workday Pitch In, where each participant created an idea for either a new product, a technology for internal use, or a philanthropic opportunity, and was then paired with a mentor to help flesh it out. Participants pitched their ideas to a panel of Workday senior executives, who then voted on their favorites, and the winning ideas have gone on to influence product and program decisions at Workday. Joe Korngiebel, vice president, user experience at Workday, rallies the Generation Workday team. Other Generation Workday events have included lunches with Workday Co-Founders Aneel Bhusri and Dave Duffield, and social get-togethers such as holiday parties, beach outings, and after-hours cantina parties, where members compete with one another for the best appetizer and drink. Demand for the best and brightest of this generation is fierce, particularly for companies that are headquartered or employ a significant number of people in the San Francisco Bay Area. Young professionals also are more open to switching employers: The median employee tenure for college graduates under 34 years of age in 2014 was less than three years, according to a U.S. Bureau of Labor Statistics report. That compares with 5.7 years for college graduates aged 35 to 44, and 8.7 years for those aged 45 to 54. This data is for all of the U.S.—in strong job markets like Silicon Valley, tenures may be even shorter. 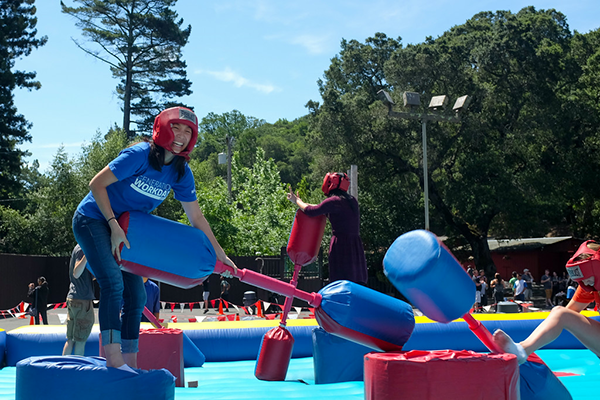 A Generation Workday member participates in paddle jousting at the “Workday Regatta Cup” last summer. The event also included a boat building competition where each team was provided a knife, cardboard, duct tape, PVC pipe, and plastic to build its creation. Workday has seen a 90 percent retention rate among employees who have gone through the Generation Workday program since it started six years ago, says Ashley Goldsmith, chief human resources officer at Workday. According to feedback collected from participants, what they like most about their jobs is Workday’s sense of community, the opportunity to do meaningful work, and seeing their contributions and ideas implemented in Workday feature releases and products, Goldsmith says. 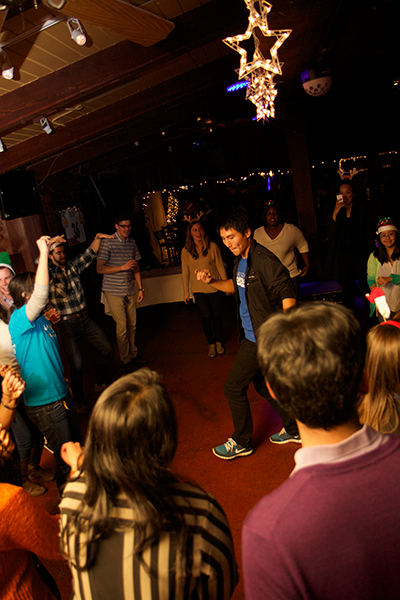 On the dance floor at a Generation Workday holiday party. Karina Sobhani is an associate application developer for Workday Student and participates in the Generation Workday program. After graduating from Cornell University last year she interviewed with several of the top technology companies in the San Francisco Bay Area, and ultimately chose Workday. Many members of Generation Workday first came to Workday through our Summer Intern program. Find out what it’s like to work at Workday from our 2014 interns, and learn about open Generation Workday positions.